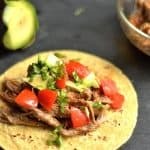 This Slow Cooker Beef Bone Broth is so easy to make, and is full of health benefits! Warm up this season with a cup, or add to your favorite soup recipe! I was giddy with excitement when I woke up with colder weather. FALL IS HERE!!! As the temperatures get cooler, there’s nothing more refreshing than a hot steaming cup of bone broth. Have you ever tried a homemade batch?? 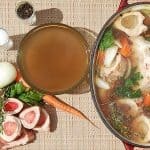 I am hoping to convince you that it is not only easy, but there are so many health reasons you should add bone broth to your diet! 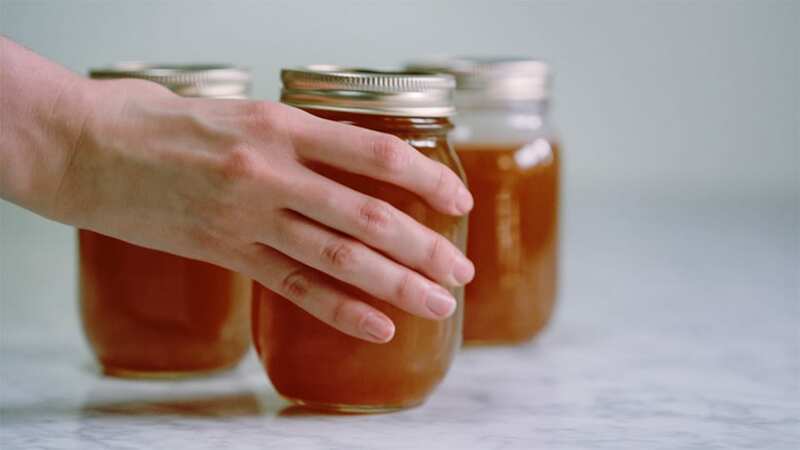 First off, bone broth helps to promote healthy gut and digestion, helps to boost the immune system and fight off illnesses like the common cold, it reduces joint pain and inflammation, and promotes strong and healthy bones. 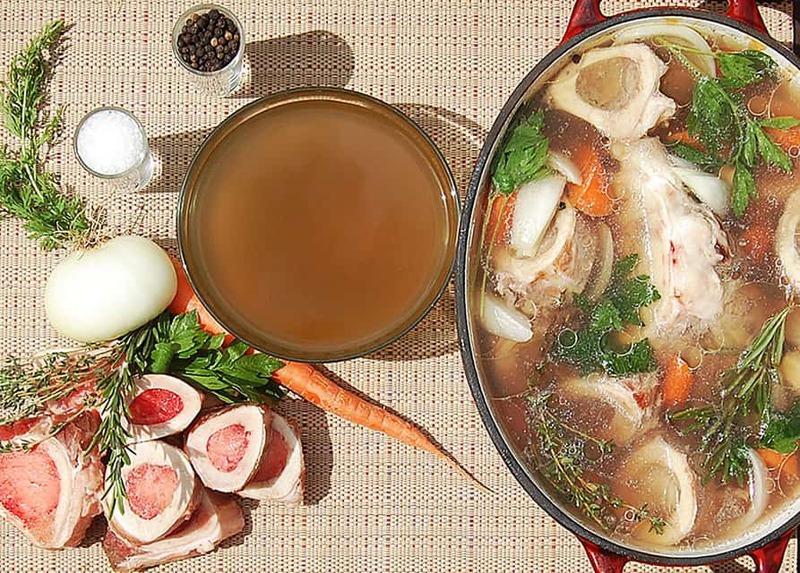 Long simmering of bone broth breaks down the proteins into a more digestible form called gelatin. The gelatin is what helps with digestion and gut health, and also helps to promote hair and nail growth. Not to mention, a bunch of minerals and vitamins contained in just a small cup! 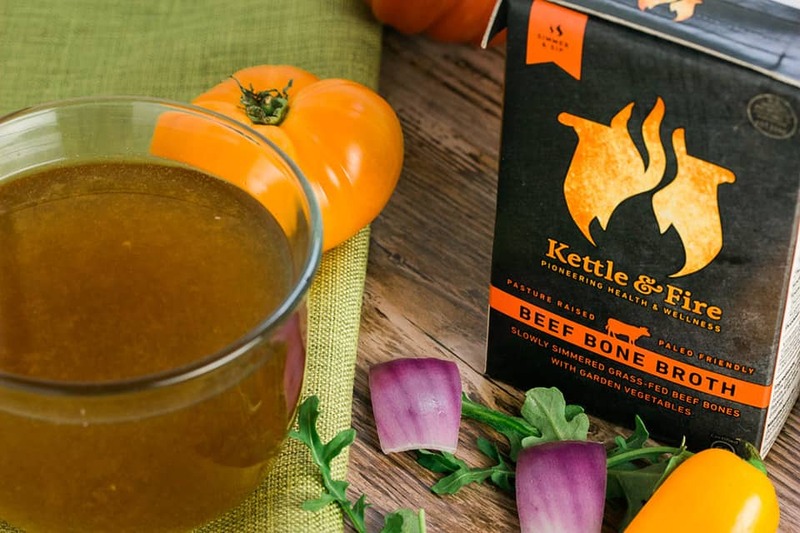 If you’re having a hard time setting aside the time, or difficulty sourcing grass-fed bones, there are a few pre-made bone broth products you can try. Personally, I like Kettle & Fire because they’re the only non-frozen and shelf stable product. If you buy their bone broth from their site, you can get 15% off with the promo code “WHOLESOME15”. I store my bone broth in mason jars in the refrigerator. You can store for up to 5 days! Heat up and drink, or serve in your favorite soup. 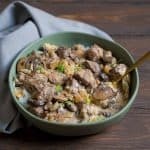 You can also use this homemade beef bone broth in one of my favorite recipes: Slow Cooker Beef Stroganoff. Enjoy! Preheat oven to 400 F. Place bones in a single layer on a sheet or roasting pan. Drizzle with olive oil to evenly coat. 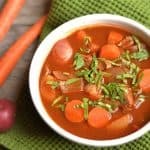 Place chopped vegetables, roasted bones, bay leaf and cider vinegar and place in your slow cooker. Cover completely with water and set your slow cooker to low. Simmer for 24 hours. Throughout simmering, add water as needed to keep all the ingredients submerged. 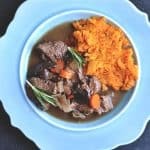 Once the broth has reached a dark rich brown color, turn off slow cooker. Discard the bones, vegetables and bay leaf and strain through a cheesecloth. Cool the broth to room temperature. Pour into jars and let cool in the refrigerator for at least 1 hour. When you are ready to serve, skim the condensed fat off the top of the broth and heat to the desired temperature. Sip in a cup or add to your favorite recipe. Thank you for sharing. I’d like to make my own once I get the time. I’m drinking Au Bon Broth and I’m liking it because of how tasty it is. It had helped me with my joint pains and sleeping issues.